Finding the right online accounting bachelor’s degree programs is not difficult. The US Bureau of Labor Statistics predicts a sharp rise in demand for qualified and competent accountant s due to a growing economy. A Bachelor’s degree in accounting from an accredited institution will prepare aspiring accountants for rewarding roles as auditors, CPAs and financial consultants. The flexibility that comes with such online programs allows students to expand their skills and knowledge and advance their career goals without sacrificing their responsibilities at work or at home. Qualified accountants may then chose careers in private corporations or in the public sector where they may provide consulting services, inspect financial documents or prepare taxes. West Virginia State University makes the list of the best value colleges for bachelors in accounting degrees. Students get to enroll for a business administration degree with a concentration in accounting and can transfer up to 72 credits. They get to enjoy studying through a flexible format. By enrolling into WVSU, you will reap the benefits of practical education and studying in a class where you have access to instructors. The accounting major teaches you problem-solving skills, communication skills, critical thinking skills and quantitative analysis. You gain knowledge that will help you find business success. You will learn from a faculty of reputable business practitioners. The program is accredited by the Accreditation Council for Business Schools and Programs (ACBSP). The university is accredited by the Higher Learning Commission (HLC) of the North Central Association (NCA) of Colleges and Schools. Bemidji State University is one of the best value colleges where you can enroll for a bachelor’s degree in accounting. The program is a great way to complete your degree if you already have an associate of arts degree, or have completed the MN transfer curriculum. Students are expected to complete 71 credits with a 2.25 GPA before they can graduate. These are some of the courses that one is required to take: Principles of Accounting, Intermediate Accounting, Cost Accounting, Auditing, Business Law, Marketing, Macroeconomics and the Business Cycle, Financial Management, Income Taxes and Markets & Resource Allocation. The fee and tuition cost per credit hour is $305.28 for online students. Just as their on-campus counterparts, all online students are encouraged to seek financial aid which is in form of grants, loans and scholarships. Based on our ranking criteria, Brescia University is among the best value colleges for online accounting bachelor’s degree programs. The online accounting program at Brescia lasts for about 2 years due to the flexible nature of the courses. Moreover, this program is very affordable with state and federal financial aid available to their students. Taking the online accounting in Brescia gives one the advantage of learning from the best professors. Assignments are timely availed and the classes are easily accessible. Apart from the easy admission process, Brescia University accepts credit transfers. A student can transfer up to 86 or 67 credits from another university or a community college respectively. 128 credit hours are the requirement for graduation. The Commission on Colleges of the Southern Association of Colleges and Schools accredits all the programs in the institution, online accounting program included. Florida tech university offers an Online Bachelor’s degree in Accounting which requires 121 credit hours. The courses offered include; Accounting information systems, individual federal income taxes, principles of accounting, cost accounting, principles of marketing and auditing. Undergraduate students are required to pay $ 510 per credit hour. Students can access financial aid in form of grants, loans from federal government and scholarships. Students can access this information through FAFSA (free application for federal student aid). There are many advantages of taking this Accounting degree because it prepares its graduates for various financial careers, management and accounting that is recognized internationally. A graduate from Florida tech can work anywhere in the world and can easily secure promotions. Indiana state university offers several degrees and one of these is an Accounting bachelor’s degree. This accounting degree equips students with business knowledge, communication skills, leadership and excellent interpersonal skills. The courses studied are; taxation, accounting information systems, nonprofit accounting, financial and management accounting and auditing. Credits can be transferred from colleges that have been accredited. Total credit hours required is about 120 and students can transfer up to 90 hours. The tuition for a full-time student taking between 12-18 credit hours annually pays $ 8,216.00. Students can access financial aid, loans from state and federal government and scholarships. This accounting degree prepares professionals that can work in various organizations; for instance; industry, business, government and non-profit making organizations. Graduates from ISU are competent accountants. Regis University is private and Roman Catholic organization. It offers an accounting degree with the following areas of concentration; principles of macroeconomics, accounting principles, income tax accounting, legal environment of business, governmental and nonprofit accounting, auditing principles and procedures. The credit hours required for this degree are 128. The tuition for the accounting degree is $ 460 for every credit hour. This degree will take duration of about four years. Students can access grants, loans, financial aid and scholarships to pay for their tuition. There are many advantages of taking the Regis University accounting degree. Graduates acquire advanced skills in accounting and financial management, analytical and quantitative skills. These professionals can work in private organizations’, nonprofit and government agencies and firms that deal with accounting. Champlain College is a private owned college and offers a bachelor’s degree in accounting. This degree equips students with skills in management, auditing and finance. Students take the following courses; federal taxes, financial accounting, accounting information systems, forensic accounting, corporate finance and financial markets and auditing. It takes four years to complete the accounting degree with 120 credit hours. Tuition for full-time students is $ 7,697.50 per semester. Champlain College offers financial aid to its students; federal loans, grants and Vermont student assistance corporation. There are many advantages of taking this accounting degree. Graduates acquire extensive knowledge in accounting, finance, forensic accounting, management and auditing. Job opportunities are many; one can work in private, NGOs, government organizations and in insurance or manufacturing companies. This is a Christian university with a student population of about 16,000. An accounting degree in bachelor of science is offered in this university. The concentration is on the following courses; intermediate finance accounting, accounting ethics, auditing, management and leadership and federal income tax. In order to be admitted for this degree, a student should be able to transfer 60 credit hours from a former university that has been accredited. 47 credit hours are required for this degree and tuition is $ 420 every credit hour. Students can access financial aid; either through grants, scholarships, loans, reimbursement from employer and veteran benefits. Taking this degree is of great significance to the graduate because it focuses on auditing, taxation and accounting theory. A graduate acquires problem-solving, analytical and practical application skills. His degree gives a strong base for the students who would like to acquire CPA certification. This is a public and diverse university. This university offers and accounting bachelor’s degree in the bachelor of science. Total cost per semester is $ 5,090 for every student taking 13 credits and above. University of Minnesota Crookston values its students’ education and therefore assists them with financial aid; through awards and scholarships, work-study and loans. A graduate will learn advanced skills in communication, theoretical accounting, leadership and analysis. Job opportunities can be accessed in the government, private and public agencies. Graduate can also become professional certified accountants worldwide. Linfield is a private college that offers liberal arts. Linfield offers a bachelor’s degree in accounting.Courses taken are; financial management, cost accounting, managerial accounting, auditing, financial accounting and federal income tax. Students are required to complete 125 credit hours. Tuition paid per credit in a semester is $ 450. Students who have already enrolled for their specific degrees can also receive financial aid or financial award from Linfield College. Advantages of taking this degree is that; it’s very cost effective, students can be tutored online, a lot of support for research and library services and assistance to plan your careers. Graduates can secure job opportunities from different sectors with this degree. Liberty University is a Christian university and non-profit institution. It offers an accounting degree in the Bachelor of Science. The concentration is on the following courses; business policy, principles of accounting, taxation, cost accounting, auditing and governmental and not-for –profit accounting. Students are required to take 120 credit hours in this degree. Students pay tuition of $ 375 for fulltime students per credit hour. Students can receive scholarships, loans and grants. Some of these scholarships can be from religious organizations, field of study and military benefits. Advantages of this degree is that it is taught from a Christian perspective and graduates are taught how to be critical thinkers and solve problems. Students also learn communication in business and computer application programs. California Baptist is a Christian and private university. It offers an accounting degree in the bachelor of science. Students should cover 70 units for this degree. Students pay tuition of $ 529 for every unit. Students receive financial aid inform of grants, scholarships and federal state loans. Some of the grants are Cal grants and Chafee grants that are available in California. Students are trained advanced accounting skills and can secure high rank accounting jobs. A graduate are confident, business professionals who are productive and also places its students’ in other firms or companies for internship programs. Central Method University is a private university. This university offers a degree in accounting that teaches students how to communicate and sole problems. Courses studied include; business law commercial, income tax, accounting principles, auditing, fraud examination and governmental and not for profit accounting. Students are required to take 124 credit hours. Tuition paid is $ 21, 630 for 12-18 credit hours every semester. Student can access financial aid either in form of federal loans or student loans, grants and scholarships. Advantages of taking this degree is because students are prepared for diverse job opportunities like tax managers, senior accountants and also gives them a strong foundation for other certifications like CPA and CMA.Business people can take this course because it’s very practical. WSU offers a competitive Bachelors Accounting degree. Courses offered are; financial management, business strategy, taxation and auditing. Students study the following courses; accounting systems and auditing, intermediate accounting, cost accounting, introduction to taxation and auditing. This Accounting degree program has 120-credit hours. It takes a period of four years to complete it. A fulltime resident is required to pay $5,698 while a fulltime non-resident pays $ 12, 239 in any undergraduate degree. Part-time students (less than 10 credits),a resident pays $570 and a non-resident pays $1,198 per credit. Financial aid and scholarships are available in WSU (Washington state university). These scholarships include; Beckman scholarship, Frank Fellows program, Boeing scholars program and Boeing e-connections program. Students gain knowledge and skills to work as professional accountants in diverse financial institutions. These institutions can be owned by the government or private organizations. This University was began in 1869 and offers a Bachelors degree in Accounting which can be done by students after completing 60 credit hours in the college that are transferable. The minimum GPA is 2.5. The curriculum has the following units; Legal and social environment for business, Introduction to taxation, Managerial behavior and leadershipintermediate accounting, business communications, forensic accounting, Auditing, , Business ethics. Every semester has fixed tuition rates which are $ 397.97 plus $ 3.00 per semester. Students can access scholarships, grants and student loans from the Federal government, state or the institution. It takes a short time to complete this degree, it’s accredited and recognized worldwide and the graduate has access to many employment opportunities. Colorado State University is accredited by the Higher Learning Commission and has special accreditation for its business program from the Accreditation Council for Business Schools and Programs. It offers online degrees such as a Bachelors degree in Accounting, a Masters degree in Professional Accounting and an online Masters in accounting certificate. Some of the courses offered through these degrees include Advanced Theory and Practice, Forensic Accounting, Fraud Examination, Advanced Income Taxation and Accounting Ethics. Tuition costs $350 per credit for undergraduate programs and $500 per credit for graduate programs. Students are offered supplemental support in the form of financial aid, military tuition discounts and military scholarships. Financial aid includes grants, loans and other federal aid options. Accredited by the AACSB, The University of Texas offers online degrees in accounting including a Bachelor of Science in Accounting, a Master of Science in Accounting and a PhD accounting concentration. The university is ranked as one of the Best grad schools by U.S News and World Report. The Bachelor of Science program includes 120 semester credit hours. The Master of Science program includes 36 semester credit hours and allows one to focus on corporate accounting, assurance services, taxation and internal auditing. Tuition costs may vary but one can expect to pay total residence fees per of $27,103 and the total rises to $50,539 for non-resident fees. It offers a Master of Accountancy degree online that is flexibly designed for working professionals through its Harbert College of Business. It is ranked among the top online programs by the U.S News and World Report. Its Master of Accountancy program is ranked at the top 5 by the Accounting Degree Review. Other programs offered include a Bachelor of Science in Accounting, Graduate Certificate in Accounting and a Master of Accounting. Possible career paths include Internal Auditor, Managerial Accountant, Financial Manager, Tax Accountant and Government Accountant. Tuition costs $805 per semester credit hour and students may apply for financial assistance through the Financial Aid Office. It is a member of the Federation of Schools of Accountancy and is also AACB accredited. Its online degree programs in accounting are delivered by the Jon M. Huntsman School of Business and are offered at the Bachelors level, the Masters level and the PhD level. Specialty areas to be discovered include Public Accounting, Financial Managing, Internal Auditing and In-house tax auditing. Tuition for residents, children and grandchildren of alumni stands at $8,889 for 12 credits. This cost rises to $18,003 for out of state students. A tuition waiver based on excellence is available in addition to other scholarship and assistantship opportunities. The University of Miami is ranked among the top 50 national universities by the U.S News and World Report. It offers various online accounting degrees like the Bachelor of Business Administration with a major in Accounting, Bachelor of Science in Business Administration with a major in Accounting, Master of Accountancy, Master of Science in Taxation and a PhD in Business Administration with a concentration in Accounting. Also available is a certificate in Accounting. Average tuition costs $1,790 per credit. It is ranked number 3 in the Best Online Programs by the U.S News and World Report and was the first accounting program to receive accreditation by the AACSB in New England. It is also recognized by the United States Distance Learning Association for Best Online Practices. It offers degrees at the undergraduate level, graduate level, PhD and certificates. Students discover topics such as Accounting Standards Setting, Accounting for Financial Derivatives, Corporate Financial Reporting Issues, Initial Public Offerings, Taxes and Business Decisions, Securities Regulation in International Markets and Cross- cultural transfer of Accounting Policies. Tuition costs $825 per credit hour. The State University of New York offers quality online accounting degrees accredited by the AACSB. The university offers a Bachelor of Science Degree program with a major in accounting and a Master of Science in Accountancy, which is designed for students with an equivalent of an undergraduate degree in accounting. Costs depend on residence status. The bachelor’s degree program costs $257 for tuition and $59 for fees for state residents and $659 as tuition and $59 for fees for non-resident students. The master’s program costs $551 for residents and $924 for non-residents with an additional $105 fee applicable for both types of students. The business programs at Syracuse University is accredited by the AACSB. 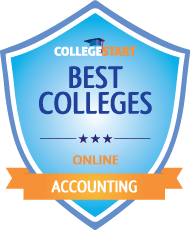 It has been named to the top 25 online Accounting programs by the Princeton Review. It offers online degrees in Accounting at the undergraduate, graduate and PhD level using a flexible online format. Topics covered include Financial Statement Analysis, Advanced Topics in Auditing, Strategic Cost Analysis, Taxes and Business Strategy. Tuition costs $40,230 for an entire year worth thirty credits. Financial aid opportunities include merit-based scholarships from the university, external scholarships and fellowships and student employment in addition to other loan programs. The University of Massachusetts offers online degrees in accounting that are accredited by the AACSB (Association to Advance Collegiate Schools of Business). It offers a Bachelor of Business Administration from the Amherst Isenberg School of Management that costs $1620. Also, the university offers a Master of Accountancy degree for students with an undergraduate degree in accounting at the Isenberg school of Management with a course cost of $2250. In addition, the university offers a Master of Science in Accounting degree, offered by the Robert J. Manning school of Business. This course costs $1830 and is offered entirely online. Applications are accepted any time of the year. Financial aid is available to online students. The University of Minnesota is accredited by the Higher Learning Commission and is a member of the North Central Association. It offers an online Bachelor of Science in Accounting. It has been ranked among the top online Bachelor’s programs in the U.S by the U.S News and World Report. Students benefit from a small class size, personal attention for each student and an exceptional and dedicated staff. Students pursuing this degree learn theoretical, analytical, Communication and leadership skills. Potential careers include Financial Accountants and Managers, Banking Management and Consultants. Tuition costs $430.77 per credit. Walden University is accredited by the Higher Learning Commission and its business program receives special accreditation from the Accreditation Council for Business Schools and Programs. This university offers online degrees in accounting such as a Bachelor of Science in Accounting, a Master of Science in Accounting and a Certificate in Managerial Accounting. Students explore advanced accounting principles. Specialization options offered include Accounting for the Professional, self-designed and Accounting with CPA emphasis. Tuition costs $320 per quarter hour. Online students are encouraged to explore tuition reduction opportunities and to exploit other forms of financial aid. Kaplan University is accredited by the Higher Learning Commission with special accreditation for its Business program from the Accreditation Council for Business Schools and Programs. It offers a Bachelor of Science in Accounting and an Associate of Applied Science in Accounting. Core courses include Microeconomics, Managerial Accounting, Statistical Measures, Federal tax and Business Math. Tuition costs $371 per quarter credit hour. Various financial resources are available to online students to assist them in paying for their education. These include scholarships, student grants and student loans. Capella University is accredited by the Higher Learning Commission as well as the Accreditation Council for Business Schools and Programs. Its online programs include a Master of Business Administration in Accounting and a Bachelor of Science in Business with an Account Specialization. Core courses include: Developing a Business Perspective, Fundamentals of Management, Fundamentals of Business Law, Fundamentals of Marketing and Sales, Fundamentals of Leadership, Fundamentals of Human Resource, Fundamentals of Organizational Leadership and Fundamentals of Accounting. Tuition costs $321 per 1000-2000 credit level and $371 per upper division credit. Saint Leo University is ranked among the Best Online Programs by the U.S News and World Report. It is accredited by the International Assembly for Collegiate Business Administration. It offers various degrees and programs in accounting such as a Masters in Accounting, Graduate Certificate in accounting and a Master of Business Administration with an Accounting concentration. These programs are available entirely online. The curriculum for these programs explore topics such as: Accounting fundamentals and Concepts, Auditing Cost Accounting, Individual Federal Income Taxes and Business Law. Tuition costs $695 per credit hour. 27. Devry University – Keller Graduate School of Management. This school offers online degrees that are flexible through a supportive and dedicated faculty. It is accredited by the Higher Learning Commission and the Accreditation Council for Business Schools and Programs. Its online degrees in Accounting include Masters in Accounting, Graduate Certificate in Accounting and a Master of Accounting and Financial Management. It offers concentrations in Accounting, Customer Experience, Business Intelligence and Analytics Management, Management, Entrepreneurship, Global Supply Chain Management, Finance General Management, Hospitality Management, Health Services, Human Resources, Information Security, Information Systems, Sustainability Management, Public Management and Project Administration. Tuition costs $766 per credit hour with numerous financial aid options available to the student to help in financing their higher education. Brescia University offers an online Bachelor of Science in Accounting which is one of the nation’s best programs. It is designed to prepare students with the abilities, skill-sets and knowledge for responsible citizenship and leadership roles in today’s dynamic business society. In order to ensure students have the relevant business skills, the program covers topics such as Business Law, Management Information Systems, Business Statistics, Business Policy, Financial Concepts, Economic Concepts, Management Concepts and Marketing Concepts. The university accepts a maximum of 67 transfer credits. The program prepares students for a career as an accountant who can work in many fields. Tuition costs $570 per credit hour. The university has been accredited by the Commission on Colleges of Southern Association of Colleges and Schools.